In the ‘80s, Los Angeles finally got back on track, both literally and figuratively. A city that once boasted a 1,000-mile interurban rail network had been without fixed-rail transit for decades: The final Red Car rolled into Long Beach in 1961; buses replaced the last Yellow Car lines two years later, in 1963. 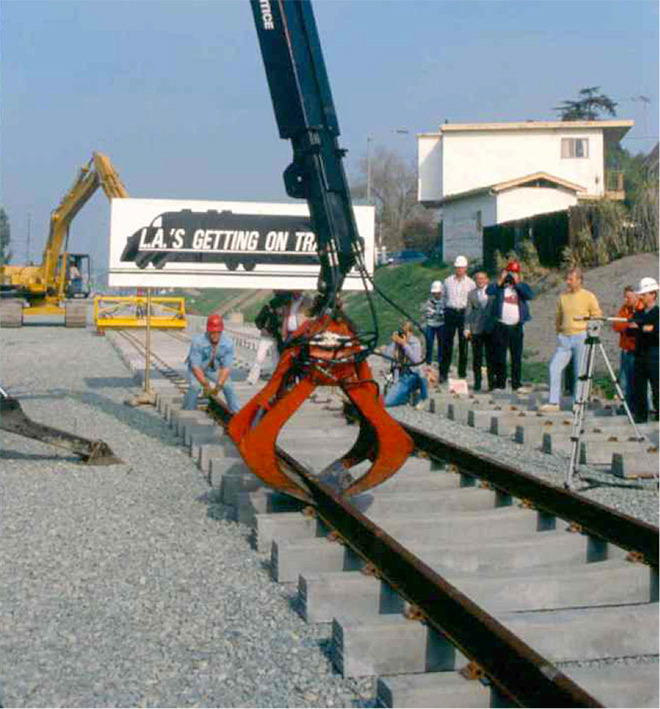 So it was a momentous occasion when on January 11, 1988, workers secured the first steel rails of the new Blue Line to their concrete sleepers. The 22-mile light-rail line would open in 1990 and shuttle passengers between downtown Los Angeles and Long Beach, signaling the dawn of a rail renaissance in Southern California. Elsewhere, workers were already tunneling beneath Los Angeles for the Red Line subway, which debuted in 1993. It may never match the scale of the old Pacific Electric, but today the Metro Rail system spans 87 miles over five separate lines—with more arriving soon. Above: Workers lay the first rails for the Metro Blue Line near the site of the Willow Station in Long Beach on January 11, 1988. Courtesy of the Metro Transportation Library and Archive.